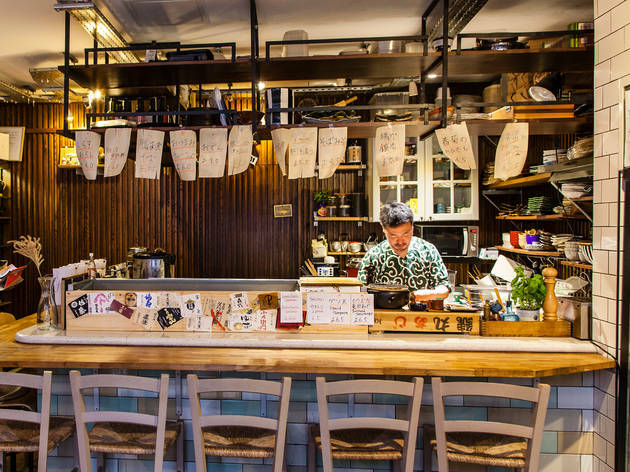 A sushi restaurant from Yuya Kikuchi, formerly of Kirazu. The chef in question is Yuya Kikuchi. 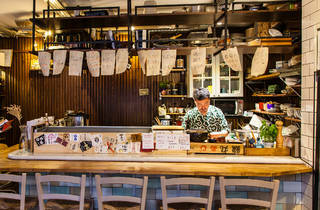 You might remember him from Kirazu on Soho’s trendy Rupert Street. 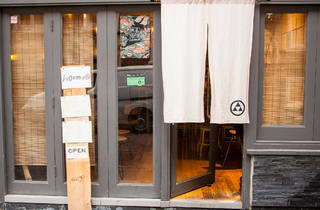 I’ll be honest, I never particularly rated Kirazu (too expensive, too cramped, with the more ‘experimental’ dishes occasionally misfiring). But I clearly hadn’t witnessed Kikuchi on top form. 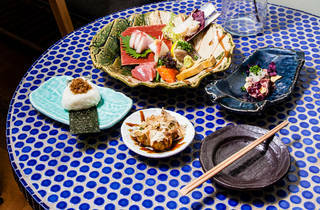 Which he absolutely now is, at this izakaya-style spot on tucked-away Winnett Street, just a minute’s walk from his alma mater. 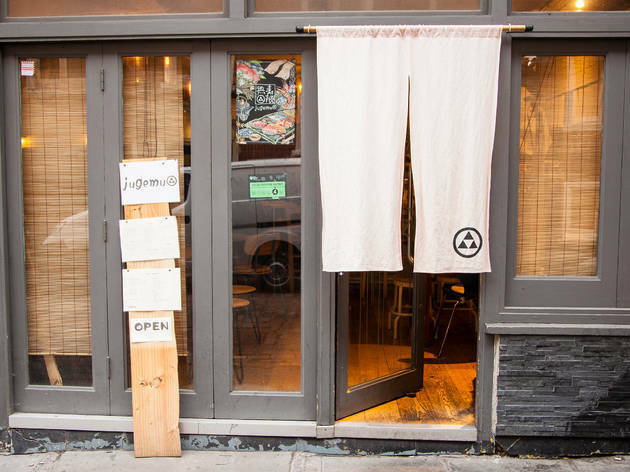 Jugemu is a humble, relaxed place. If you’re after a cold drink, your waitress will fetch one from the wall of fridges for you. You hang up your own coats on pegs or a wooden stand. 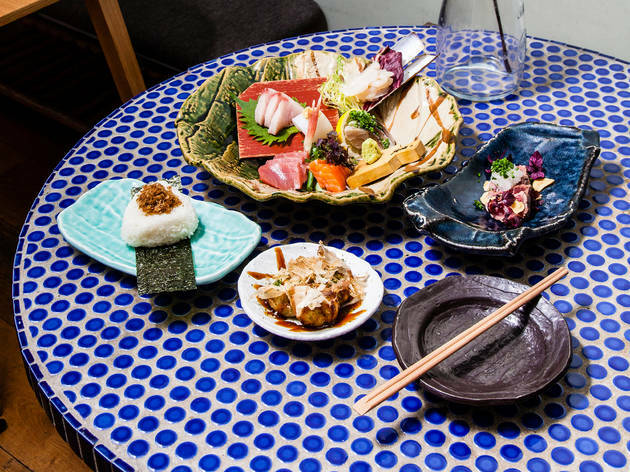 To order, you just take one of the paper menus (regulars, specials, sushi) and pencil in how many of each dish you’d like. Start with the cold stuff (I mean, other than sushi). The seaweed salad was as good as it gets, as was the beef tataki, but if you really want to put the ‘ooh’ in ‘umami’ then get the tomato with wasabi: a bowl of firm tommies, confetti-scattered with flakes of bonito and micro-strips of nori, plus a soupy wasabi-laced sweet-soy dressing at its base. It looks too pretty to touch, but don’t hold back: you need to mess it up to unleash its full flavour. 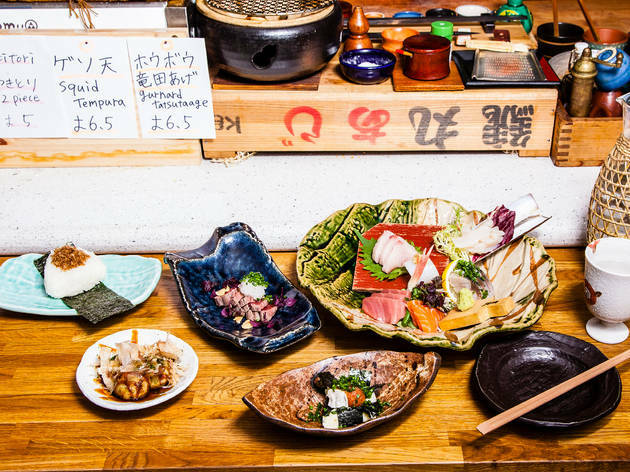 Then order a few of the (warm) street food snacks, from all-the-rage takoyaki (deep-fried balls of octopus-studded batter, topped with two-tone blobs of mayo and tangy takoyaki sauce), or the bonito flake rice balls. Addictively savoury. 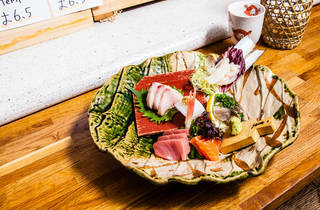 And finally: sushi and sashimi. 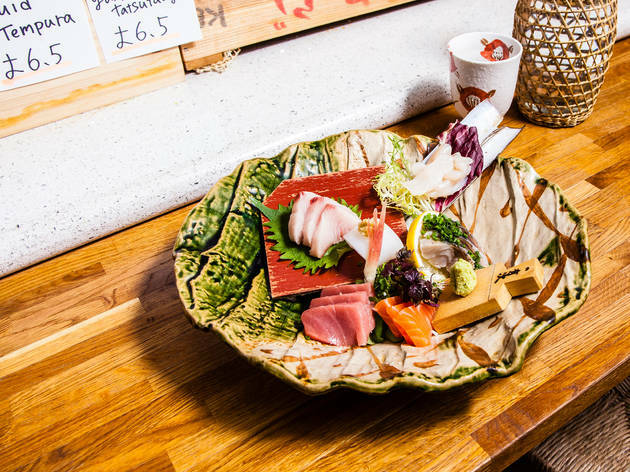 Yes, it’s the most expensive option, but when you consider that a ‘mid-sized’ platter of sashimi for £24 gets you the equivalent of five plates at Itsu, it’s actually a great-value £3 a plate. Come with a mate, order a few cheap carbs to bulk it out and you can eat incredibly well here for not too much cash. Getting a seat can be tricky – this is one of those joints that seems to be closed as often as it’s open, with no online booking. But trust me, it’s worth the effort. Just for the hand rolls. 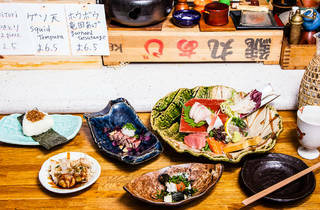 good food but boy terrible, obnoxious service to non japanese...plenty other options in London sorry! Not even worth 1 star. If you would like to be fed like a cattle, go there. Otherwise don't. The service is ridiculous here. I would avoid! tiny portions, overpriced and super slow.